100% free YouTube downloader to save your favorite videos to your computer. Why us? 1. Completely FREE: Free of charge & Ad-free. 2. Various methods to download YouTube video. 3. Download video in batch. 4. Transfer downloaded video to device wirelessly. Download videos from YouTube for free without trial time limit and download any video from 100+ sites like Vimeo, Hulu, Vevo, Veoh, Metacafe, AOL, etc. Also convert the downloaded video to play on your iPhone, iPad & anywhere. Registration is required to support non-YouTube sites after 5 videos. Why Choose Wondershare Free YouTube Downloader? The easiest way to download videos from YouTube: The Download button that YouTube doesn't provide. The most convenient player to play the downloaded videos without installing a player, a codec or anything. A free media player to play your existing FLV, MP4 and WebM media files. Full screen playback is supported. A wireless transfer method to send YouTube files to your iPhone, iPod or iPad. Support for HTML5, HD, HQ and 4K and all video resolutions. Frequent updates and free support. It won't stop working in someday morning. A possibility to upgrade to higher version for more important features. Why You Need A YouTube Downloader? Well, this is a good question because you know the answer, right? Tell us if we haven't included it below. Download YouTube videos to play on mobile devices without an Internet connection, or doesn't support YouTube online. Hate buffering. This is a big problem when you're watching HD videos with a slow Internet connection. Some YouTube videos will be removed sometime, someday. Download it right now to keep it your way. You want to make a remix of various YouTube videos, or only interested in a specific part of the video. To replay a YouTube again and again on your mobile device, downloading it will save traffic and improve experience. Play YouTube video on your iPhone, iPad, and iPod. Extract music from a YouTube video to build your music library. Wondershare Free YouTube Downloader will add a floating download button to any YouTube video so you can save it in one click. Besides, "Drag URL" and "Paste URL" will also work like a charm. Usually the downloaded FLV video won't play on your Mac and Windows. Wondershare Free YouTube Downloader includes a powerful media player to play FLV and other formats without any hassle. It's reasonable to watch downloaded YouTube video on your Android, iPhone, iPad and other mobile device. Now with the help of Wondershare Player App, you can just scan the QR code to transfer saved video easily. This feature is designed for those who want to play YouTube video on devices that doesn't support FLV or who want to reduce video size. All main stream media formats are supported so you can play YouTube offline virtually anywhere. You won't only explore and watch videos on YouTube when you are surfing the Internet. There are thousands of video sharing sites like Vimeo, Hulu, TED, CBS, ABC,, etc. The PRO version supports 100+ video sites including adult sites. YouTube is not only a video site but music sharing site. There are tons of music videos from top stars. With Wondershare YouTube Downloader, it's easy to capture music to your hard drive and build a large music library for free. 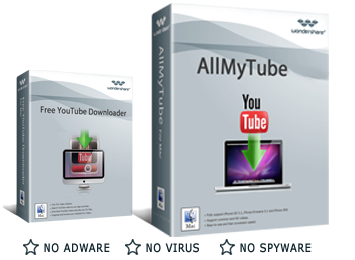 Download YouTube video in all resolutions and formats like HTML5, HD, HQ and 4K. Use the latest technology to transfer the downloaded video and play them anywhere you want. Besides YouTube, you can also download unlimited videos from sites like Vimeo, Vevo, CBS, ABC, TED, AOL, Metacafe, DailyMotion, HULU, NBC, BBC, MTV, and so on. Create music file from online video and build your own collections of favorite music for totally free. Wondershare YouTube Downloader helps you make YouTube video ready for editing or playing with iMovie, Windows Movie Maker, iDVD, Apple TV, XBox, etc. free-youtubedownloader.com is not affiliated with YouTube™ or any of its partners. YouTube™ is a registered trademark of Google Inc.